How amazing are you? Walking and talking away! You celebrated Thanksgiving with all of our family and you enjoyed it so much! You had us laughing because you were talking away during dinner! You loved eating everything! Thank you Baby led weaning! 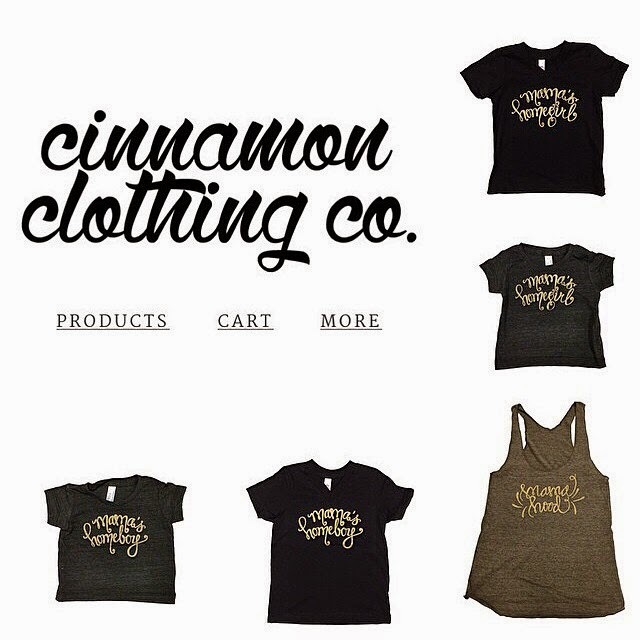 ;) We are getting all ready for Christmas (post-Thanksgiving) and we are so excited to celebrate your first one! All the holidays have so much of a better and more fun meaning than they ever did before! I just love experiencing all of your firsts! Both Nana and Grandma gifted you an ornament (the same one- great minds think alike) and Daddy and I did the same. We decorated the tree together and it was amazing to see you watch everything with so much curiosity! We took you to the San Diego Zoo and had such an amazing time together! You enjoyed all of the animals and the perfect weather! It felt like we had most of the zoo to ourselves! Loved it! We also went to a birthday party which you enjoyed, too! Mommy is loving all of your cute holiday pjs! Too cute, Baby! We visited Santa Claus and you did amazing! Until you realized you were on his lap and cried, haha! He gifted you a little tractor that you came home and played with a lot! You have mastered how to drink from a straw cup and we are excited for this! Mommy stopped pumping at work so now we will be using all of our stored milk! Let's see how we do- one month away from our goal of a year! For Christmas, we visited our loved ones! You did amazing! We had a lovely lunch at Urth Cafe with all of your uncles and Titis- how loved you are! We also go to visit Auntie Zvart and her baby boys! 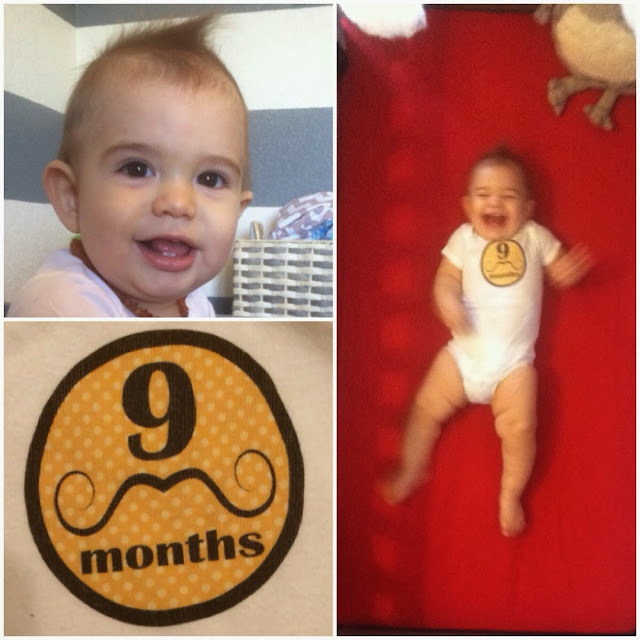 On the day you turned 11 months, we celebrated by going on a hike in Whittier with Titi Anita! That was fun! You rode with Mommy! Then you had a lovely Christmas Eve with your familia! On Christmas Day, we drove back to AZ and celebrated your first Christmas with your family there! Oh how loved you are Baby Boy! You truly are the sweetest most amazing baby I have ever met. And you are ours. I cannot express enough how much we absolutely love you! You are so sweet and special! This month, we took our Christmas card pictures. Just you and Honey Munster- it was such a quick and easy shoot because you are simply adorable. Most stylist baby ever! You wake up so happy on the weekends! On one of these, we took you to chase air balloons- still in pjs and all! It was so fun! Daddy even had to help rescue the giant balloon while we waited on the side of the road! You are on the move! You won't even sit during your baths! You love to play rough with Daddy! And you have officially taken off walking! There is simply no stopping you! 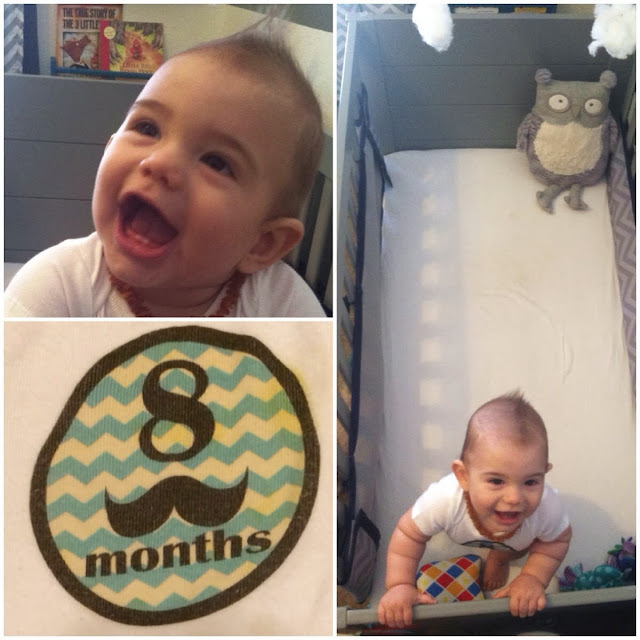 Happy 9th month, Baby Boy! We celebrated Halloween and my goodness, could you be any cuter. You had a few costumes, haha! A strongman and a donut, hahaha! Mommy was a theif, Daddy was a cop, Honey Munster was a loot bag, and you were a donut! Oh man! Both were hilarious and so cute! Mommy couldn't decide which one for your first so we went with both! You really love your family! The bond you and Nana have is amazing! You can take a step or two here and there- does that mean you're walking?! I think I'm in denial! You laugh and giggle so hard and loud- it's the sweetest sound in the world! Honey loves giving you besitos- not my favorite, haha! You really enjoy being with your cousin, Karston, too! So happy you two get to grow up together! We already know you are going to be the troublemaker, haha! You are spectacular! This month started off so excitingly! Daddy had to go to L.A. for a work conference! We got to tag along and stay in Downtown L.A. and have such a blast! The first couple of days were your photoshoot in San Diego! You did AMAZING! It will be a long time before we find out what your pictures will be used for but you made us so proud! Daddy couldn't be with us so Titi Maritza was amazing and took us! You are our shining star and everyone just loves you! Mommy got to celebrate her birthday with her girls for an evening, too! Mommy and you had our own little date in Malibu and sat on the beach and had a great time together! We got to hang out with Allie and Asher, too! We love them! We took you to Titi Marlyna's job and you loved playing at her office! We saw Auntie KK there, too! She loves you so much! We just had such a blast! You got to spend so much time with your Tito, Mama, and Titis and cousins! Exactly what we wanted! I hope we get to have this mini vacation next year again! You had your very first pancake- shaped like a Jack-o-Lantern nonetheless! You loooved it! You are such a great little eater and you stand non-stop! I think you may be starting to want to walk any day now, too! But it's way too soon! Don't grow up too fast, son! We took you to the pumpkin patch and you chose the biggest pumpkin! So naturally, we did what any parents like us do...you got your very own photoshoot in it, hahah! 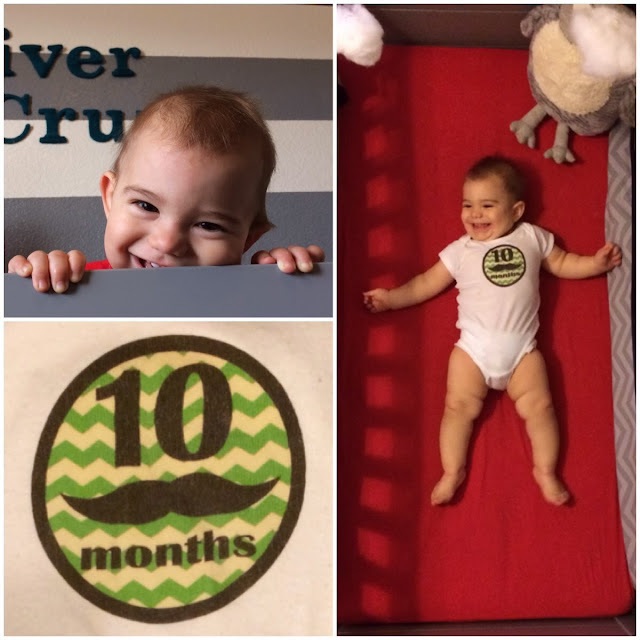 You got more shots at the doctor this month and you were such a trooper- such a brave baby boy! You give tons of "besitos" on command, too! Cutest thing ever! Titi Anita came to visit for a few days and boy, did we love having her here! Best trip ever! 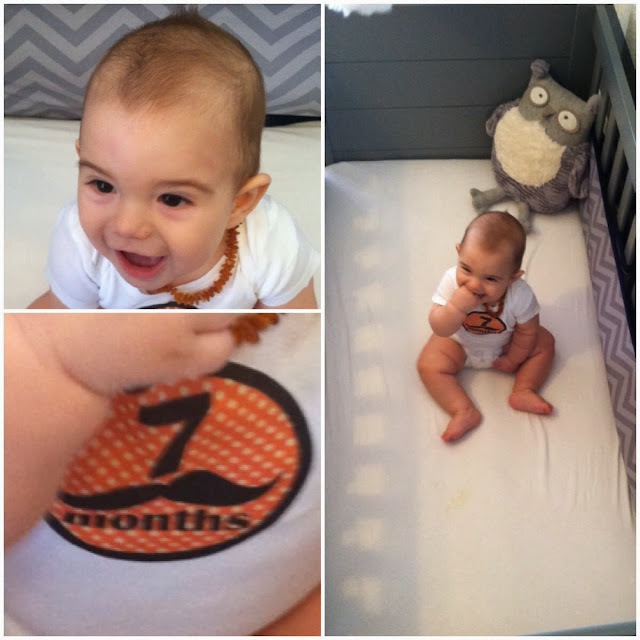 The day you turned 7 months old, you started to crawl! haha! Now you are unstoppable! You workout with Mommy every day! You are still running Baby .5ks with Daddy every night! You are enjoying going to your Nana's while we work; she takes such great care of you! You love to sing- especially sing yourself to sleep or sign along to the radio! You are still the smiliest/happiest little baby boy we have ever met and everyone cannot get enough of you! Every other Friday, you and Daddy come visit Mommy at work! You wear your owl backpack and are the most stylish little guy ever! On Friday nights, we go to Mommy's school's football games and you love watching the game and being passed around from person to person; but you don't appreciate the loud crowd all the time. You pick yourself up on anything and everything you can! Mommy is still nursing you and pumping at work every day so that you get nothing but what is best for you! You got to celebrate Daddy's 31st birthday in September! You had fun helping him blow out his candles and giving him your birthday gifts. I think you are his greatest gift ever- everything he has ever wanted! The weekend after Daddy's birthday, we surprised him with a trip to Julian, CA- just like he used to go when he was little. We had such a great time even though it was pretty rainy! We had lunch with your grandparents and family and then we went to a wine festival! Mommy and you went grape stomping, haha! It was awesome! Then we had fresh pie and ice cream! Such a perfect trip! We also had to get you a work permit because you were chosen to be a baby model! Later in September, we are taking you to San Diego. The Step2Company and Infantino Company will be hosting a photoshoot for the Everybody Plays Campaign shot by Kelli Hampton! We are so honored, humbled and excited! You still love your veggies- always stealing Mommy's asparagus! You say "Dadda" all the time! I keep telling myself it's just "ta-daaa!" haha- just because I'm bummed it's not "mama!" Haha! You helped Mommy celebrate her birthday, too! Mommy left you for the first time on a Saturday- but only during the day! Titi Squirrel flew into town to spend the weekend with us and you loved having her here! We went to visit your little cousin Asher at Titi Becca's this month, too! He is so precious and itty bitty! Excited for our lives! 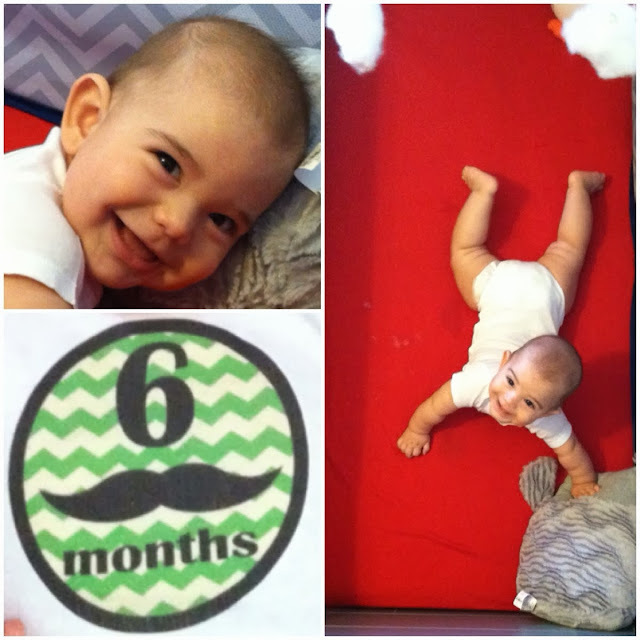 We started you on solids the day you turned 6 months! Your first foods were sweet potato and avocado which you enjoyed very much! Mommy is trying out babyled weaning! She is making you baby food, but mainly going to give you little pieces rather than purees. We'll see how it goes! So far you love it! You even love Chipotle's guacamole, haha! And bananas- you literally went bananas for bananas! haha! You are determined to feed yourself using your spoon but are definitely not there yet haha! You have had a couple of playdates this month! We visited your Titi Becca, Aiden and Rian- and the little baby that is in her belly- we think it's a boy! You also played with two of Mommy's friends' little boys. It was cute! Daddy sold his '51 Chevy this month. It was so bittersweet for him, you watched in awe. And boy, are you teething! 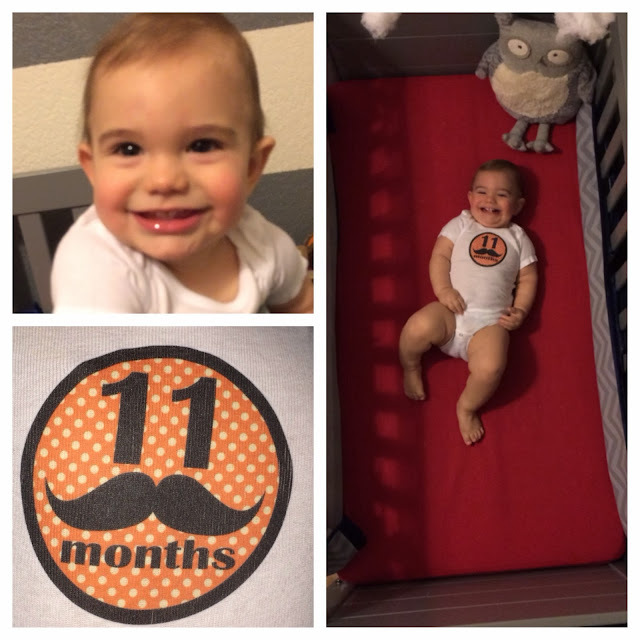 It feels like you have been teething since 2 months! You also took your first sink bath! We were waiting until you could sit up properly on your own and you have been doing that since last month so it made for the cutest picture! You also got to sit in a shopping cart for the first time! It was fun- and at Target just like a lot of our firsts! You are standing while holding on to things and really like to do that! And boy, do you love books! You are trying to crawl! You have the perfect plank! You get up on your toes and arms, and hold it forever! Then you'll get on your knees and rock back and forth! Mommy had to go back to school full-time this month because the school year started. You will be going to Nana's house instead now! This will be the first time Mommy doesn't get to come home for lunch. So sad! You love playing with your Daddy! He makes you laugh unlike anyone else can! It is the sweetest thing! You love to nap with him! You take much better naps with him than with Mommy! You love to walk around Nana's coffee table! Or pull yourself up and hold on! Grandma and Auntie Sarah come over a couple times a week to watch you so Mommy and Daddy can go to the gym together! You really enjoy your time with them! You went to your second birthday party (the first was Auntie Jenn's Sophie's and Zoey's). This one was Titi Yuky's Natalia's second birthday! You wore a birthday hat and enjoyed yourself! Daddy was working so he couldn't go! You are still doing those baby-5-point-k's with Daddy most nights!